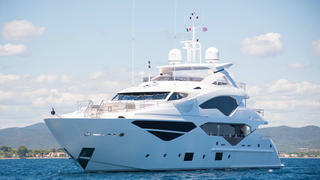 The third hull in the Sunseeker 131 Yacht series, Jacozami, has been delivered to her new owner in the Mediterranean. Launched by Sunseeker International earlier this year and sea trialled in April, Jacozami has been pictured in St Tropez shortly after being delivered to her new owner. The 40.05 metre tri-deck yacht features a semi-displacement hull and was styled inside and out by the Sunseeker International team. Triangular hull windows give her a distinctive appearance and allow plenty of natural light to penetrate the superstructure. On the main deck, Jacozami is split into three main zones: a casual lounge, formal dining area and the master suite, which stretched across the full 8.09 metre beam. Her layout comprises accommodation for 12 guests and eight crew, including two VIP cabins and two convertible twin guest cabins, all of which are en-suite. Entertaining spaces on board Jacozami include the upper-deck skylounge, sun deck Jacuzzi and foredeck seating area, while the extended bathing platform allows water toys and tenders to be launched easily. Power comes from a pair of MTU diesel engines, which give this 189.6 tonne all-GRP yacht a top speed of 25 knots. When trimmed back to 12 knots, the 21,560 litre fuel tank allows for a maximum cruising range of 1,500 nautical miles. Jacozami is the third Sunseeker 131 Yacht to be launched since the turn of the year, with the Poole-based yard already having successfully delivered Zozo and Take 5. The fourth Sunseeker 131 is already under development and is due to launch before the end of the year. Based in the South of France, Jacozami is one of the most prominent new yachts available for charter with prices starting at €158,000 per week.